There is often a lot of confusion as to what a liqueur actually is. 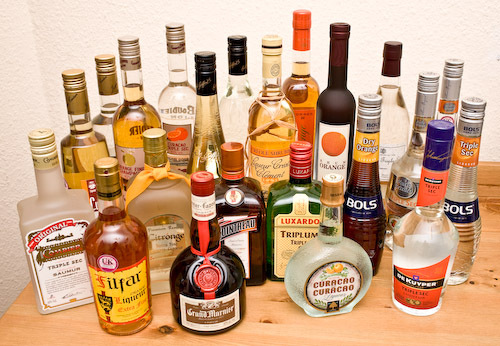 Liqueurs come from the widest category range of spirits and are intended to be consumed after a meal or in cocktails. They also have the most varied colour spectrum of all alcoholic drinks from clear to luminous toxic looking blues, greens and yellows!! But that’s not all. In the EU, a liqueur must have a minimum of 100g per litre of sugar as well as a minimum alcohol level of 15% abv (alcohol by volume) and this includes cream liqueurs like Baileys, however, if it’s a ‘créme de cassis’ it must be a minimum of 400g per litre whilst other ‘créme de….something need only be 250g per litre. So the likes of classic dry aperitifs Absinthe etc, these are not actually liqueurs as they don’t meet the sugar level requirement. In the USA, the sugar level minimum requirement is around a quarter of the EU e.g. a minimum of 2 ½ % by weight of the final product. Baileys is the largest single liqueur brand in the world! The majority of liqueurs purchased and consumed these days are brandy, rum or whisky based with a flavour or flavours added to them via maceration and/or re-distillation. Typical flavours used are herbs, spices, flowers, peels, cream, fruit and nuts. So what are the more well known liqueurs made of? Grand Marnier is one of the most complex liqueurs. Dried bitter orange peel is macerated in Vodka before then being distilled. It is then blended in Cognac and other ingredients before being sweetened and left to infuse and blend together. Interesting some fruit liqueurs are allowed to be labelled ‘Brandy’ alongside the fruit name, for example Cherry Brandy, yet they are not made using Brandy!! 7. King’s Ginger – speaks for itself and available from Waitrose! 10. Luxardo – the UK’s biggest Sambuca brand! ← Every year is a vintage year!! !